We are currently repairing our glass furnace, so we won’t be able to blow glass in NZ until the furnace has been rebuilt and dried out. 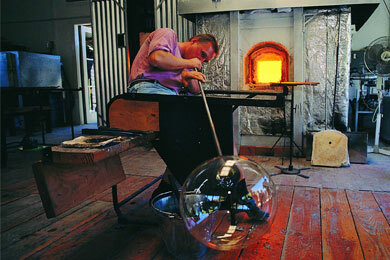 We hope to be blowing glass again in time for the New Zealand summer season starting in December. We are still working in our cold workshop, finishing off (grinding and polishing) the glass we made before the furnace was turned off. The gallery is fully stocked with a wide range of vases, goblets, perfume bottles, paperweights, platters, bowls, oil & vinegar bottles and glass jewellery. Ola will be blowing glass at our ‘jungle-studio’ in Far North Queensland this winter. We are looking forward to try out new ideas and make some new pieces. Marie has been working on Graal blanks ready to be blown as soon as the furnace is fired up.